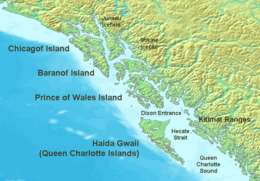 For other islands named after the Prince of Wales, see Prince of Wales Island (disambiguation). Prince of Wales Island is one of the islands of the Alexander Archipelago in the Alaska Panhandle. It is the fourth-largest island in the United States (after Hawaii, Kodiak Island, and Puerto Rico) and the 97th-largest island in the world. The island is 135 miles (217 km) long, 45 miles (72 km) wide and has an area of 2,577 sq mi (6,674 km2), about 1/10 the size of Ireland and slightly larger than the state of Delaware. Approximately 3,000 people live on the island. Craig is the largest community; founded as a saltery in the early 20th century, it has a population of 1,000. Some 750 people live in Klawock, a long-established village that grew with the fishing industry. Hollis was a boom and bust mining town from 1900 to about 1915. Abandoned, it was re-established as a logging camp in the '50s. It now has a population of 100 and is the location of the ferry terminal. Mountain peaks, all but the tallest of which were buried by Pleistocene glaciation, reach over 3,000 feet (914 m). Fjords, steep-sided mountains, and dense forests characterize the island. Extensive tracts of limestone include karst features such as El Capitan Pit, at 598.3 feet (182.4 m), possibly the deepest vertical shaft in the United States. Moist, maritime conditions dominate the weather. The Tongass National Forest covers most of the island. Within the forest and on the island are the Karta River Wilderness and the South Prince of Wales Wilderness. Many of its wildlife, such as the Prince of Wales flying squirrel (Glaucomys sabrinus griseifrons), are found nowhere else. The island is in the Prince of Wales-Hyder Census Area. Prince of Wales Island is the homeland of the indigenous Kaigani Haida people. Kaigani is a mispronunciation of the Tlingit word x'aax' aani, which translates to "crabapple country". The Tlingit name for the island is Taan, meaning "sea lion". The island is traditional Tlingit territory. The Haida migrated into the area in the late 18th century. Abandoned Haida villages still have Tlingit names. In 1741, Aleksei Chirikov, commanding a ship on Vitus Bering's second voyage of exploration out of Kamchatka, made the first recorded European landfall on the northwest coast of North America at Baker Island on the west coast of Prince of Wales Island. He did not stop for any length of time there. The next European arrival was in 1774, when Juan Pérez led a Spanish expedition sailing in a 39-foot boat from La Paz, Mexico (then a Spanish colony). They reached Sumez Island off of Prince of Wales' west coast. In 1779 a British expedition under Captain James Cook passed Prince of Wales Island. Comte de La Perouse led a French expedition to the area in 1786. Karta Bay is the site of the first salmon saltery in Alaska. Settlers began mining of gold, copper, and other metals on the island in the late 19th century, as European Americans entered the area to exploit the natural resources. Gold production came from underground lode mines exploiting: gold-bearing quartz veins in metamorphic rocks (such as the Gold Standard, Sea Level, Dawson, Golden Fleece and Goldstream mines); skarns (at the Jumbo and Kassan Peninsula copper-gold mines); zoned mafic-ultramafic plutons, as at the Salt Chuck silver-gold-copper-PGE mine; and VMS deposits such as Niblack. Uranium was mined at Bokan Mountain in the 1950s and 1970s. Historically, logging was the mainstay of the collective Prince of Wales economy through most of the 20th century. The decline of the industry since the late 20th century has resulted in only a few small-scale sawmills operating. In 1975, the Point Baker Association and others sued the United States Forest Service to prevent logging 400,000 acres (160,000 hectares) on the northern portion of the island. In December 1975, Judge von der Heydt issued a ruling enjoining all clearcutting on the 400,000 acres (161,874 ha) on Northern Prince of Wales Island west of a line from the west side of Red Bay to the easternmost point of Calder Bay. In March 1976, the United States Congress responded to the suit by passing the National Forest Management Act, which removed the injunction. Still, only half of the marketable timber was cut on the north end of the island. Road construction and logging on the north end of the island at Labouchere Bay commenced early in 1975. Living on a floating camp beginning with the retired tugboat Irene leased as a floating hotel, employees of Robertson & Sons began cutting trees, clearing stumps, and blasting rock in order to build pads for mobile trailers for both the road construction and logging families. The camps were ready in early June for Robertson employees to bring in their families. Under the supervision of the US Forest Service, logging began in 1976. In 2010, Senators Lisa Murkowski and Mark Begich introduced S730 to privatize stands of old growth forests on the island. Tourism, including sport fishing, is an important part in Prince of Wales' economy. Two factors have led to the increase of tourism on the island. Roads built for the logging companies years ago have enabled better access to different parts of the island for hiking and camping. The second was the new Inter-Island Ferry Authority. Commercial fishing provides the foundation of the economy for numerous towns on the island including Craig, Klawock, Hydaburg, Port Protection and Point Baker. During the summer, trollers and seiners both fish for all five species of Pacific salmon. Longliners bring up halibut and black cod. Dungeness crab and shrimp seasons are open throughout the year. During the winter there are dive fisheries for geoducks, sea cucumbers, and sea urchins. Since Prince of Wales Island is almost entirely made up of federal land, the two ranger districts (Craig and Thorne Bay) on the island provide employment for a number of residents. Mineral exploration continues at many projects on Prince of Wales Island. The only producing uranium mine in the entire state of Alaska was located on the island, the Ross-Adams mine in Kendrick Bay. Current remediation projects have been reported in local media, and continued exploration of rare earth metals continue in the region. Bokan Mountain has been rated by the Technology Metals report as a location (tied with Canada's Strange Lake) containing the third highest of "relative" quantity of individual critical rare earth oxides, a way of comparing rare earth mine reserves. In 2012 the Pentagon issued a contract to perform a mineralogical and metallurgical study of the mountain. "The Bokan – Dotson ridge REE" rare earth deposit on Bokan Mountain owned by Ucore is estimated to hold 5.3 million tons of heavy rare earths with 207,000 tons dysprosium. It is a small deposit on a global basis but the largest in the United States. The mine is on a fast track to commence operations in 2017. Ucore Rare Metals Inc. paid about $1 million for a 9,421 acre claim to the family of a prospector who held uranium claims for many years on Bokan Mountain. A 2,500 mile road system, which taxpayers paid for in credits to logging contractors, was built on the island. However, many of these roads are now being decommissioned as unnecessary in the post-clearcutting era. Only a small percentage of this road system is paved, currently no further than Naukati. The gravel roads cost between 150,000 and 500,000 per mile in today's dollars. Point Baker and Port Protection chose in 1974 not to be connected to the road system. There is now a newly designated state "scenic highway" - the 500-kilometer (310 mi) Prince of Wales Island road system. The highway reaches almost every community on Prince of Wales. A few companies provide scheduled barge service from Pacific coast ports to southeastern Alaskan ports, including those on Prince of Wales island (primarily Craig). Historically, the Alaska Marine Highway (AMHS) intermittently served the port of Hollis, until the Inter-Island Ferry Authority began regular scheduled service. The Inter-Island Ferry Authority (IFA) provides daily service on a three-hour, 36-mile route between Prince of Wales Island and Ketchikan. It ferries more than 50,000 passengers and 12,000 vehicles between Hollis and Ketchikan annually. The system is more than a form of transportation - it is an economic engine for southern Southeast Alaska, generating jobs, commerce, and tourism - while also increasing community well-being. In 2015, the IFA brought 3,000 tourists to Prince of Wales Island, where they spent more than $10 million on hotels, fishing expeditions, and dining - generating hundreds of summer jobs across the island. It provides a means for the seafood industry to move millions of pounds of high-quality, high-value fresh and live seafood to market, creating hundreds more jobs. It provides access to health care for a thousand island residents who use Ketchikan's medical services without the cost, inconvenience, or weather-related delays of flying. It shuttles workers to their jobs. It reinforces Ketchikan's status as the regional economic hub, as Prince of Wales residents spent more than $14 million there in 2015 on groceries, goods, services, and medical care. The Inter-Island Ferry allows for cultural and social commerce as well. Students, tribal members, and other residents use the system to participate in basketball games, totem pole raisings, trainings, college fairs, celebrations, and funerals. There were 3,100 student trips last year. This allowed students from 13 different Alaska school districts the opportunity to challenge themselves and interact with their peers. It connects residents to family, friends, and recreation. The ferry is a critical piece of a more extensive transportation network. It provides transportation security on days when the skies are rough, and access to transportation to those who cannot afford alternative means. Nearly a quarter of the ridership last year were senior citizens and young children, who have saved a combined $17 million over the cost of flying since the system began in 2002. Its reliable arrivals and departures - so precise that people are said to set their watches by it - have enabled organizations to build their business models around this daily transportation connection. The result of the IFA's efficient operations is farebox revenue that covers a full 85% of the ferry's operational costs, a significant rate in the world of public transportation. The word businesses and residents most frequently use to describe the ferry service is "invaluable." While there are many intrinsic values of the system that cannot be measured, an analysis of the ferry's economic impact in the seafood, healthcare, visitor, transportation, and retail sectors shows an impressive $52.2 million combined impact in Ketchikan and Prince of Wales in 2015. Klawock Airport (IATA: KLW, ICAO: PAKW, FAA LID: AKW) is the only airport on Prince of Wales island. Four commercial airlines in Ketchikan provide scheduled service to Prince of Wales island. Air taxi or chartered flights are also available from them and other airlines. Holly Madison, American model and Hugh Hefner's former girlfriend. Elisabeth and Roy Peratrovich, early Alaskan civil rights advocates, heavily involved in passage of Alaska's Anti-Discrimination Act of 1945, first civil rights law in the U.S. Elizabeth Peratrovich Day is Alaska's equivalent of Martin Luther King Day. ^ "Prince of Wales Island". Geographic Names Information System. United States Geological Survey. Retrieved May 3, 2009. ^ Bidlack, Allison L.; Cook, Joseph A. (2001). "Reduced genetic variation in insular northern flying squirrels(Glaucomys sabrinus) along the North Pacific Coast". Animal Conservation. The Zoological Society of London (4): 283–290. doi:10.1017/S1367943001008885. ^ Kan, Sergei (2015). Sharing Our Knowledge. Board of Regents of the University of Nebraska. p. 210. ISBN 978-0-8032-4056-8. Retrieved 27 February 2018. ^ "Exploration and Settlement on the Alaskan Coast". Harriman: History of Exploration. pbs.org. 2011. Retrieved July 14, 2011. ^ United States. Census Office (1893). Report on Population and Resources of Alaska at the Eleventh Census, 1890 (Public domain ed.). U.S. Government Printing Office. pp. 30–. ^ US Forest Service 1989-94 EIS for Ketchikan Pulp Company. ^ Berry-Frick, Anissa (March 25, 2010). "Murkowski should try harder to listen". Juneau Empire. Juneau, Alaska. Retrieved July 14, 2011. ^ Areddy, James T. (2011-08-17). "A Timeline For Eroding China's Rare Earth e reserves. Chokehold". Wall Street Journal. Retrieved 2011-08-17. ^ ""US Department of Defense Contracts With Ucore for Metallurgical & SPE Studies."". Archived from the original on January 22, 2013. Retrieved October 1, 2012. ^ a b Daniel Grushkin (October 27, 2011). "Alaska's Billion Dollar Mountain". Bloomberg Business Week Magazine. Retrieved July 9, 2013. ^ Steve Fisher (July 8, 2013). "In Alaska, Rare Earth Discovery Pits Jobs Against Environment". New American Media. Retrieved July 9, 2013. ^ 1989-94 USFS EIS for Ketchikan Pulp Company. ^ Correspondence of the Attorney General of Alaska to the USFS 1974-1975 and 1974 Final USFS EIS. ^ "Location Identifiers". Federal Aviation Administration. ^ "Island Air Express". Island Air Express. ^ "Pacific Airways, Inc". Pacific Airways, Inc.
^ "Harris Aircraft Services, Inc". Harris Aircraft Services, Inc.
^ "Taquan Air". Taquan Air. Wikimedia Commons has media related to Prince of Wales Island, Alaska. This page was last edited on 29 October 2018, at 03:11 (UTC).